1909, Vito Grimaldi comes to America. A baker by trade, he does what he does best. Some things are just in the blood. 1923, Joseph Grimaldi, Vito’s son, decides he, too, likes the bread business. Some things are just in the blood. Remaining true to the hearth baking process, he finds that hot bread can be delivered fresh daily to stores throughout the area. Quality bread builds sales. Demand leads to increased production. Grimaldi’s moves, moves again, moves again. Finally, in 1959, Vito builds his “dream” bakery. On a corner, in Ridgewood, the “Home of Bread” opens its doors. Neighbors come in droves for hot, fresh bread...just like his Grandfather Vito made. Trucks carry it daily throughout the tri-state area. Out-of-towners hear of the bread, try it, want to get it in their area. Vito grows & grows his bakery to serve them. A new century, in a new millennium...Vito’s children — Joseph, Angela & Margherita, and their spouses — and grandchildren carry on the family tradition. Real hearth bread, scratch-baked every day, for all the neighbors...down the block...across the city...by express, all over America. Dreams can come true, if you are true to them...some things are just in the blood. At Grimaldi’s “Home of Bread”...our name is always on the door. Our aim is to make the finest baked goods, today, tomorrow, everyday. Blending the best ingredients, using traditional methods, never forgetting our family tradition, and our obligation to our neighbors, who come to us for their daily bread. At Grimaldi’s we never forget...our name is on the door. Grimaldi Bakery Corporation is a neighborhood bakery. It’s just that over four generations of family ownership, our “neighborhood” has grown from a few blocks, to a city, a region, and on across the whole country. 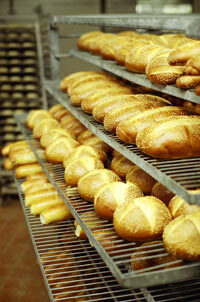 Real Hearth Bread has always been the core of our business. True to our history, we use the finest natural ingredients, and traditional methods to produce a full range of hearth-baked breads & rolls. Judicious use of modem technology allows our wholesale division to bring the quality goods, sold in our retail store, around the city by DSD, and across the nation (through our broker-distributor network) in both P-B and T&S formats. Grimaldi’s “Home of Bread’™ offers franchise opportunities to qualified individuals seeking to replicate our success, and bring unique baked goods to their own communities. Home-About Us | Retail | Wholesale-Fresh | Wholesale-Frozen | Contact Us © 2009 Grimaldi’s Home of Bread. All rights reserved.